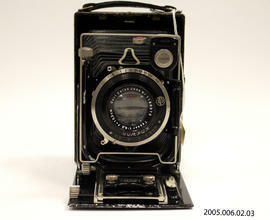 This series contains cameras designed for use with commercially manufactured dry plate negatives. Produced between about 1880 and 1900, these cameras began to be marketed to amateur photographers due to the relative ease of using dry plates. Exposure times shortened, necessitating faster shutters, within the lens or camera. 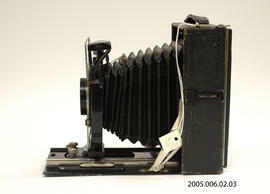 The equipment also became more compact, allowing for hand-held photographs. Cameras from the Wilhelm Nassau collection donated by Wilfred Laurier University in 2011.